I love this house. 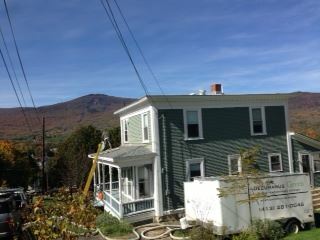 It is located in Adams, Massachusetts, on the eastern part of town with a stunning view of Mt. Greylock. In my mind it is a perfectly proportioned house with tasteful trim and carefully conceived details. It calls to mind Virginia Lee Burton’s description of the house in her children’s book: “She was a pretty Little House, and she was strong and well built.” It suffered an unfortunate renovation at some point (I suspect the 40’s or 50’s) that involved tacking on a decidedly not well proportioned and ill-conceived addition on the back. Nevertheless, it is a beautiful home, with an interior suited to its period. The rooms are small and gather around a central chimney, which would have housed its sole heating source. The house speaks of original owners who were of modest means but who strove for something more, something grander. It lacks pretension but speaks of aspiration. It was a house built at a time of high social mobility, but also a time of seemingly infinite supplies of energy. Its structural construction reflects this cheap, abundant energy supply. The construction is a bit of a hybrid, something between a plank house, which is built more or less like a barn and is just as difficult to heat, and a later, more common manner of framing which involves empty cavities between framing members. The house does have cavities, but they are quite small, only about an inch and a half thick. We were called in to insulate this house. The wall construction allowed us to put in less than 2” of insulation, which yields about a r-7.5 wall (r-value measures the insulating power of a material or assembly.). In contrast, the super-insulated house we are building in Cummington will have r- 45 walls. Even with the latest retro-fit insulating techniques, this house cannot be made energy efficient without a major rebuild.